PANELFAB is a well-established, family owned, Queensland business dedicated to the economical design, construction, and installation of transportable buildings for sale and hire. At PANELFAB we pride ourselves in our ability to design and create affordable, customised and environmentally friendly portable buildings to accommodate specific lifestyles as well as professional requirements. This is why we continue to lead the way in modular buildings. PANELFAB units are available new or used, for sale or hire, throughout QLD, NSW and NT. You can have confidence that PANELFAB are offering you the most competitive prices. We have no financial restraints such as overheads as our Wacol premises and our entire fleet are owned exclusively by PANELFAB and we also have a zero borrowing policy. We also have a no nonsense approach to business, as the business owner is the person running the business. Read our building testimonials to see what our clients have to say. 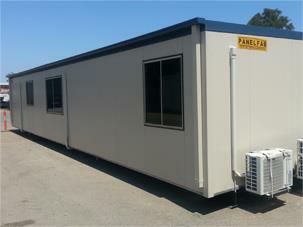 One of Australia's leading Manufacturers and Distributors of Transportable Accommodation for sale and hire.